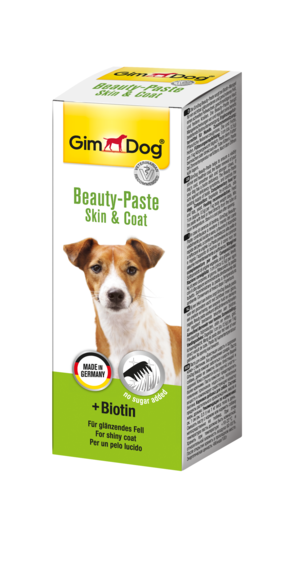 GimDog Beauty-Paste helps to ensure a visibly shinier and healthier coat, the faster renewal of your dog’s coat, smoother skin and stronger claws, if your dog has a biotin deficiency. The Beauty Paste acts against deficiency symptoms, and controls the existing supply of biotin. Feed 1 cm (approx. 0.5 g) per 1 kg body weight daily. Mix the paste with food or feed directly from the tube at room temperature.